2009. Antsy's personal favorite, this album was written first to help himself heal, to grow and to move on. At once upbeat and reflective, the themes of this album run deep. 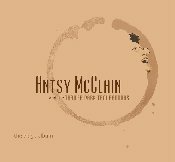 Recorded with a variety of A-List Nashville and California musicians, this pure "Folkabilly" album is stripped down and intimate, using a lot more guitar, dobro, fiddle and mandolin than you've heard on any previous McClain album. Antsy wanted this album to sound like "we are all sitting around on my front porch, and the listener is in the porch swing with a glass of iced tea in their hand.